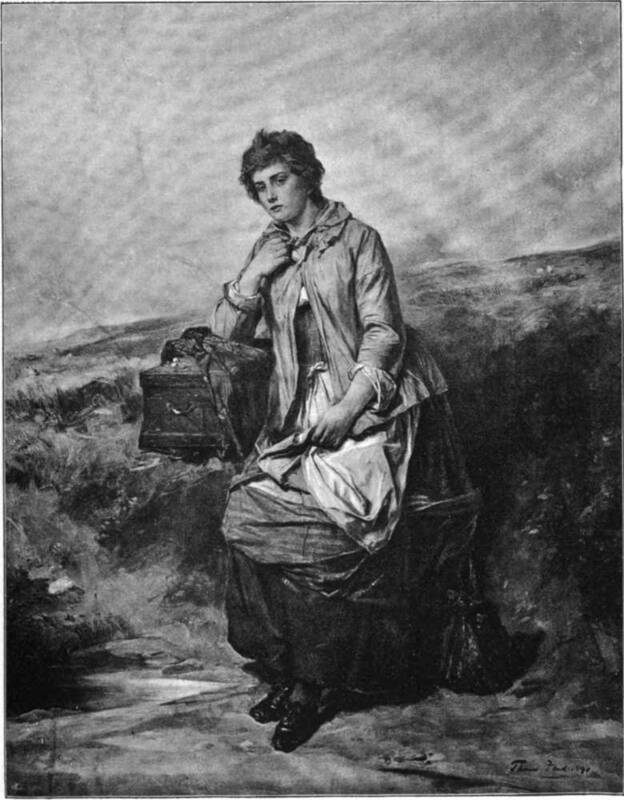 By far the most interesting of the rustic beauties whom the genius of Burns has immortalized is Mary Campbell, the object of the deepest passion of his life, and the inspirer of some of the loveliest songs he ever wrote. His acquaintance with her began when he was in his twenty-third year, and while he was living at Mossgiel with his brother. She was at that time a servant in the family of a gentleman in the neighborhood. They solemnly pledged themselves to each other. "We met," says Burns, "by appointment, on the second Sunday in May, in a sequestered spot by the banks of the Ayr, where we spent a day in taking a farewell before she should embark for the West Highlands to arrange matters among her friends for our projected change of life." Their farewell was accompanied by all the simple ceremonials common among the country-folk on such occasions. The lovers, standing on each side of a small brook, laved their hands in the stream, and, holding a Bible between them, vowed to be faithful to each other. This Bible is now preserved at Alloway with other relics of Burns ; and to one of the covers is fastened a lock of Highland Mary's golden hair. Within are inscribed verses of Scripture relating to the sacredness of vows, in the poet's handwriting. The artist, with exquisite grace and tenderness, has depicted Highland Mary as rest ing by the roadside on her journey to her home. Shortly after her arrival there, various mischances made Burns for a while think or seeking his fortune in the West Indies. It was then that he wrote the song, "Will ye go to the Indies, my Mary?" It was but a few months after their parting on the banks of the Ayr that Mary Campbell left Inverary to meet her lover, to take leave of him before his proposed departure. But on the journey she was seized with a fever, and died in a few days ; the tidings of her death reaching Burns before he had even heard of her illness. How passionate was his griei at this loss, and how lasting his memory of his early love, is known to every one. 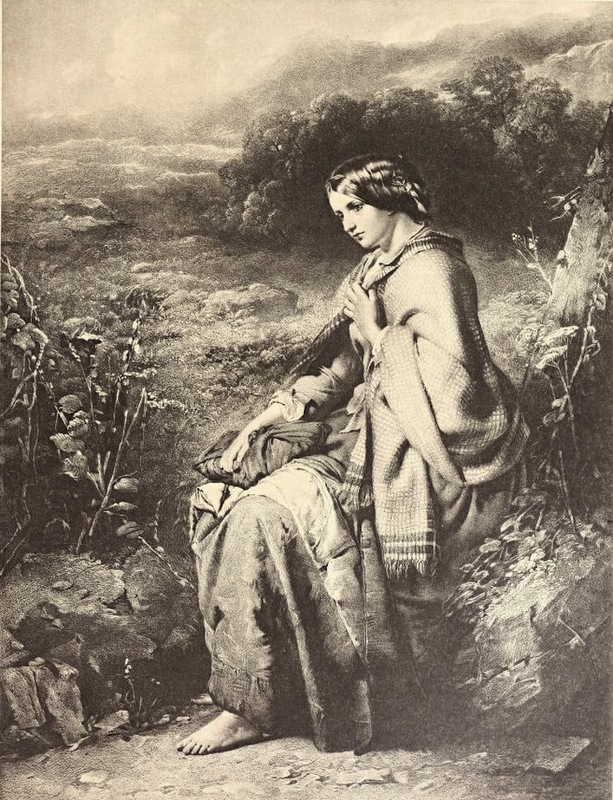 Three years after her death he wrote the exquisite elegy, "To Mary in Heaven"; and, some years later, the song of "Highland Mary." I aft hae kissed sae fondly. Sir John Steell's statue of Burns in Dundee, which depicts the poet drawing inspiration from his "Highland Mary"
The Faed gallery, a series of the most renowned works of Thomas Faed, reproduced in heliotype; with full descriptions, and a sketch of the life of the artist. Boston: James R. Osgood and Co., 1878. Internet Archive. Contributed by the Getty Research Institute. Web. 17 May 2018.